There are calls for an inquiry into a bug that has hit the London Underground's new Oyster card system. A glitch has prevented some underground passengers from getting through Tube barriers. The Liberal Democrat candidate for Mayor Simon Hughes said the problem had got worse since the system crashed a week ago. A Transport for London spokesperson said there were "teething problems" but denied there was a system-wide bug. 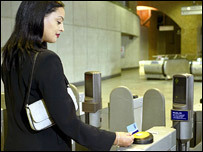 The idea behind the Oyster card is to pay in advance to avoid the queues when buying tickets. Mr Hughes said: "If there are bugs that cause misery for customers and staff then serious questions must be asked about the timetable and testing that was used to implement the card. "Passengers need this sorted now so that they can have the easy payment system they were promised." Commuters whose cards have been affected will see the words "seek assistance" and the number "24" displayed in the bottom left-hand corner of ticket barrier screens. The company that runs the Oyster card, Prestige, has denied claims that it is recalling some of the cards.